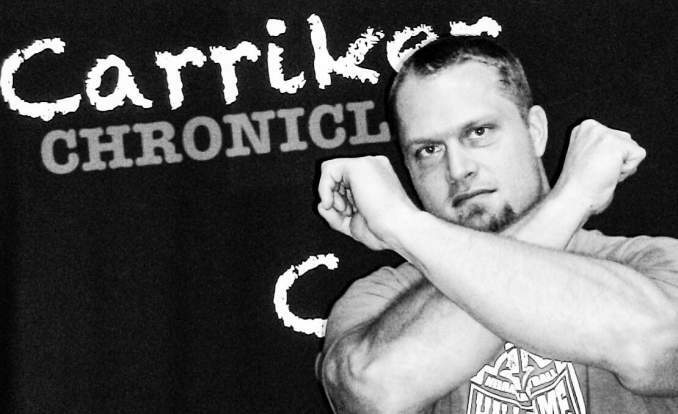 Welcome, Husker Nation, to the Carriker Chronicles and today I’m a little bit extra excited because I love talking Husker football, but I love watching college football in general and NFL football in general. So I’m excited to get to talk about something a little bit different today. I’m going talk about the College Football Playoff, and I’m going to explain to you why, in my opinion, I believe the College Football Playoff Committee got the four teams right; I’m going to explain to you why Penn State does not deserve to be in the top four; I’m going to explain why Penn State shouldn’t even be ranked as high as they are; and also I’m going to talk about some questions that my friends and I have discussed. Which is should the College Football Playoff should expand or stay the same. But the first thing I’m going to do is tell you how I got to my top four teams. I actually put it out for everyone to see at noon on Sunday; I didn’t know the College Football Playoff had already been announced. I thought it was going to be Sunday night. So I put these out before I knew what the College Football Playoff Committee had said and you can compare and see why I agree with them when we’re all done with this. But, here’s how I got to my top four teams. I listed out my top eight teams without doing a whole lot of research. I had number one Alabama, number two Clemson, number three Washington, number four Ohio State, and I put them there simply knowing they hadn’t won their conference. These were the four loss teams. Number five I had Michigan, I had Penn State at number six, I had Oklahoma at seven, and Wisconsin at eight. So the first thing I did was put Alabama at number one. Can’t stand Alabama, but they’re the best team in the country so far this year. Then what I did was I went to the bottom; who can I eliminate? Because Alabama’s one, two through four’s a little more muddy, so let’s start eliminating from the bottom. I looked at number eight Wisconsin, saw they had three losses, no conference title, you’re out. I looked at number seven Oklahoma. Now, Oklahoma, they lost to Houston pretty soundly, and they lost by three touchdowns to Ohio State, and they have two losses. So I have two losses and they were soundly beaten in both those losses. Now they won the Big 12, but the Big 12 isn’t one of the stronger Power Five Conferences so, in my opinion, they were out as well. Now I’m down to five teams vying for the final two through four, the final three slots. So I next went to number two. Who am I going to put at number two? I put Clemson. They played a pretty decent schedule, respectable schedule. They were a one-loss, Power Five conference champion. I knew I was going to put them in so I put them in at number two. Now I’ve got four teams vying for two spots. So what did I do? I looked at the Big Ten teams, Ohio State vs Penn State. Right off the bat, Penn State conference champion, plus one Penn State. Penn State beat Ohio State head-to-head, plus two Penn State. What does Ohio State got? Ohio State has one loss so now it’s two to one in favor of Penn State. I looked at their schedules and I looked at Ohio State’s schedule. And they have the most impressive schedule and resume of any team that I looked at. When I looked at Ohio State, they played four teams in the top-10, they beat three of them, and three of those four games were on the road. So to me, Ohio State had one less loss and they played a tougher schedule, so now it’s two to two. So how do I break this tie? So to me, what haven’t I looked at yet, when comparing these two teams? I’ve looked at their wins, I’ve looked at the champion of the conference, I’ve looked at head-to-head, I’ve looked at total losses. What haven’t I looked at? The only thing I haven’t looked at yet is the losses themselves. So let’s break those down. Penn State lost a close game to Pitt, a respectable team, and Ohio State lost a close game, on the road by three points, at Penn State. The other loss that Penn State has is a 39-point loss to Michigan. If you lose by almost 40 points, ladies and gentlemen, I’m sorry, you do not deserve to play for the National Championship. You can’t look at things in a vacuum, say they won their conference, boom, that’s it, they should be in. No, you have to look at the whole entire resume, the whole entire season, that’s what makes college football so special and different from every other sport. So to me, that gave Ohio State the tiebreaker over Penn State so now Ohio State is in. I looked at Michigan. Two losses, great resume, but no conference championship. I’m sorry, you’re out. So to me, it now came down to Washington and Penn State. Because Ohio State already booted Penn State, so could Penn State get in over Washington? To me it came down to Penn State had a slightly tougher schedule, although Washington’s schedule, they played two teams in the top-10 and four teams in the top-20. The thing that hurts them is they had the second-worst non-conference schedule of the entire FBS, 128 teams. So that’s what hurt them. But to me, once again, one loss vs two. Penn State had a tougher schedule so that kind of balances out so what’s the tiebreaker? It’s losing by almost forty points to Michigan. So I put Washington in over Penn State. It’s like when Nebraska, in 2001, got blown out by Colorado and then got in the Rose Bowl. We deserved to be in a BCS game at the time but not the National Championship. Same case here with Penn State. So I have Alabama one, Clemson two, now I have Michigan five because they beat Penn State head-to-head by almost forty points. So Michigan five, Penn State six, Oklahoma seven, Wisconsin eight. Now, how do I seed these teams? The final number three team and number four team? Because you want to end up with the two best teams in the National Championship. I looked at Ohio State vs Washington; one’s got a conference championship, one has a tougher schedule. What I saw was that Ohio State has the toughest schedule, the most impressive resume, of any team in the College Football Playoff. Honestly, it’s kind of not even close between those four teams. Four teams in the top-10 and beat three of those four teams. Let me remind you, no other team in the top four did that. I moved Ohio State ahead of Washington because the difference in the schedule was too much, even though Washington was a conference champ. So now, I have Alabama, Clemson, Ohio State, Washington. Now I looked, it doesn’t really matter, they’re going to play each other but I was just curious. Should I move Ohio State ahead of Clemson just for kicks and grins? I looked at it. Clemson, conference champ, one loss just like Ohio State but they were the conference champ, but the difference between the schedules wasn’t like this, like Washington and Ohio State, it was like this. I gave the benefit of the doubt to the conference champion, which was Clemson. So I have Alabama, Clemson, Ohio State, Washington, just like the College Football Playoff Committee. The difference is I have Michigan fifth. I don’t know how you beat a team by almost forty points and get ranked right behind them. Then Penn State sixth. My friends and I have discussed expanding the College Football Playoff. Should we go to six teams? My issue with that is, why? So you can let a so you can let a Michigan team in that has two losses and didn’t win their conference? So you can let a Penn State team in that lost by almost forty points? No, those teams don’t deserve to be in. Let’s go to eight teams possibly, why? So you can let an Oklahoma team that got beat twice, soundly, get in? Or a three-loss Wisconsin team get in? No, I don’t agree with going to six or eight teams, even twelve to sixteen teams I’ve heard people say. If we do that, you realize you’re going to let four-loss teams in? You would let a team like Florida State in who lost 63-20 this year. Or a team like Colorado who’s already lost to a team in the playoff by a score of 41-10. Most of these schools, almost all of them, didn’t win their conference champion. So I’m not a fan of expanding; if you want to do that, just take the regular season out back and shoot it straight in the forehead. I mean just kill the regular season. This is what makes college football so special. I love college football and I love the NFL, but I don’t get excited about the NFL until the playoffs. You can go 9-7, like the Giants did, and beat an 18-0 Patriots team and be Super Bowl Champions. Are they really the better team, or did they just happen to win on that day? You can go 7-9 like the Seahawks did six, seven, eight years ago, whenever it was. They won a playoff game, they were only one or two playoff games away from getting to the Super Bowl. You know what their record would have been in the Super Bowl had they had gotten there? 10-9. NFL’s great but College Football, the regular season is so special and I really don’t want to mess with that. Now, four teams. Why do I want to keep it at four teams, specifically? I don’t think every Power Five Conference Champion should get in. You can’t tell me they all deserve to get in, much like Oklahoma. I don’t think they’re one of the four best teams this year. Also, on top of that, it makes it much more interesting. You have to schedule stronger because you have to beat another team out, who possibly won their conference, and is a one-loss team. You have to look impressive, every game matters if it’s only four teams. Now, honestly, I don’t think Ohio State should be playing for the National Championship this year if you want to know my honest opinion. They didn’t win their conference. How can you play for the National Championship if you don’t win your conference? But, the system we have dictates four teams. They’re one of the four best teams. Looking at the whole entire resume and looking at the four best teams you’ve got to put Ohio State in. I will say this, I’ve come up with a playoff system years ago that’s rather hard to explain, which is why I don’t make videos about it because it would take awhile, but once you get it, it’s very simple. I may or may not do that video, depends on how many people hit me up. I will say this, I almost didn’t do this video today. We woke up this morning, or last night, our daughter threw up a dozen times, at least. Our other daughter threw up in her crib, one of the twins, Desire, threw up all over. Dakota had stuff coming out all over the other end, and I walked into their room and it smelled like a dog kennel. It was a mix between vomit, and poo, and some other smell I can’t even describe. So my wife’s been to the urgent care, the emergency room, the doctor’s office, so I’m just glad to get this video in. Be sure to tune in, it’s like the zombie apocalypse here at the Carriker house right now, but be sure to tune in tomorrow because I’m going to take a quick, preliminary look, it’s not going to take long. A quick, preliminary look at Tennessee, the team that apparently likes to Volunteer a lot. So this was a bonus video today, back to our regularly scheduled program of every Monday and Wednesday, at least for the time being until the bowl game. So until tomorrow, Husker Nation, Go Big Red, and always remember to Throw the Bones!